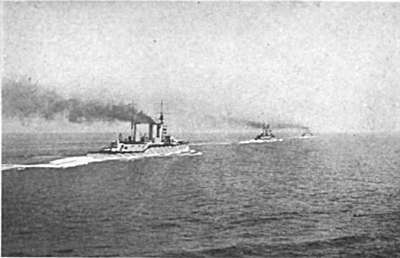 To the left is HMS Lion on fire. By the Navigating Officer of HMS New Zealand. "All seemed to be going well with us on New Zealand when suddenly I saw a salvo hit Queen Mary on her port side. A small cloud of what looked like coal-dust came out from where she was hit, but nothing more until several moments later, when a terrific yellow flame with a heavy and very dense mass of black smoke showed ahead, and the Queen Mary herself was no longer visible. The Tiger was steaming at 24 knots only 500 yards astern of Queen Mary, and hauled sharply out of the line to port and disappeared in this dense mass of smoke. We hauled out to starboard, and Tiger and ourselves passed one on each side of the Queen Mary. We passed her about 50 yards on our port beam by which time the smoke had blown fairly clear, revealing the stern from the after funnel aft afloat, and the propellers still revolving, but the for'ard part had already gone under. There was no sign of fire or of cordite flame, and men were crawling out of the top of the after turret and up the after hatchway. When we were abreast and only about 150 yards away from her, this after portion rolled over and, as it did so, blew up. The most noticeable thing was the masses and masses of paper which were blown into the air as this after portion exploded. Great masses of iron were thrown into the air, and I saw, I suppose at least 100 or 200 feet high, a boat which may have been a dinghy or a pinnace, still intact but upside down as I could see the thwarts. Before we had quite passed, Queen Mary completely disappeared."